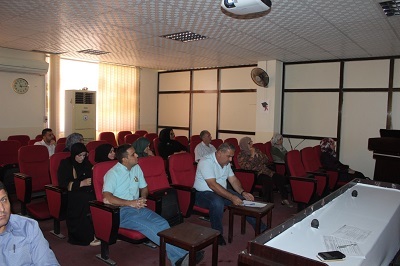 During the chemical engineering department's cultural and scientific activities for the first semester for the academic year 2017-2018, a master student, Enass Mahmood , present a lecture on the effect of micro and nano particles on critical heat flux enhancement in al-khawarizmi hall at the department. The lecture examined the effect of addition of nanomaterials and microorganisms to distilled water and study the effect of fluid containing these molecules on CHF using (Ni-cr wire heater) and showed an improvement in the use of nano fluid more than (microfluid) also, the study of the nano tube effect on BHT during boiling and there will be a layer on the surface of the heater. The cause or mechanism of this layer is due to the fact that the process of boiling the nanotube leads to evaporation of water and thus lead to the deposition of these nanoparticles on the surface and form a porous layer on the bright Increase the moisture of the surface and the wet ability is measured by measuring the contact angle between the drop of liquid on the surface and the surface of the heater. It was found that the higher the thickness of the deposition layer, the lower the angle between the drop of fluid and the surface and increase the CHF.